This week I am still working on Christmas presents and that includes giving these guys (and gals) a new wardrobe. 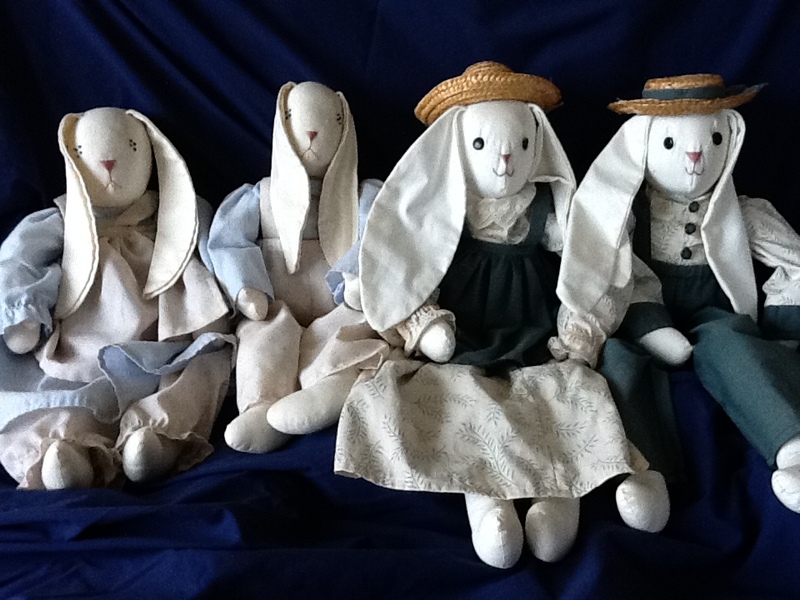 Remember when these “Country Rabbits” were all the rage in the 80’s and 90’s? I made so many of them for sale back then that I lost count. These two pair were made for my mother back then. She specifically requested these and seemed to cherish them greatly. She had me make one pair for her home and one pair for her motor home. Now that she has passed, they have been given back to me and they mean so much more to me now. So, I have decided to make new clothing for them and pass them on to a family who I hope will love them as much as mother did. I just love creating special gifts for each individual person or family. There is so much commercialization today that time is the only thing you can give that is truly a gift. When we take the time to make or do something specifically for another because we know it will make them happy it means so much. Sometimes, a special gift is something that the person wants that can be commercially purchased (iPad, car, etc…), but sometimes, it is more special when we give something that only we can create and we use our time and talent to do so. I’ll post updated photos of these guys when I get them done. I love seeing how talented your are!